Other American Iris Society affiliate clubs have interesting information printed in their newsletters. There are about 160 affiliate clubs throughout the United States and Canada, and we intend to list but a few from time to time that may provide useful text and pictures about growing irises in a different part of the country. The current listing is below. There be many kinds of Iris or Flouer-de-Luce, whereof some are tall and great and some little, small and low. Some smell exceeding sweet in the roote, some have not anie smell at all; some flowers are without any smell and some with; some have one color, some have many colors mixed; Vertues attributed to some, others not remembered; some have tuberous or knobbie rootes, others bulbus or onion rootes; some have leaves like flags, others like grass and rushes. A long experience has taught me that Iris grown from seed vary in a wonderful way. 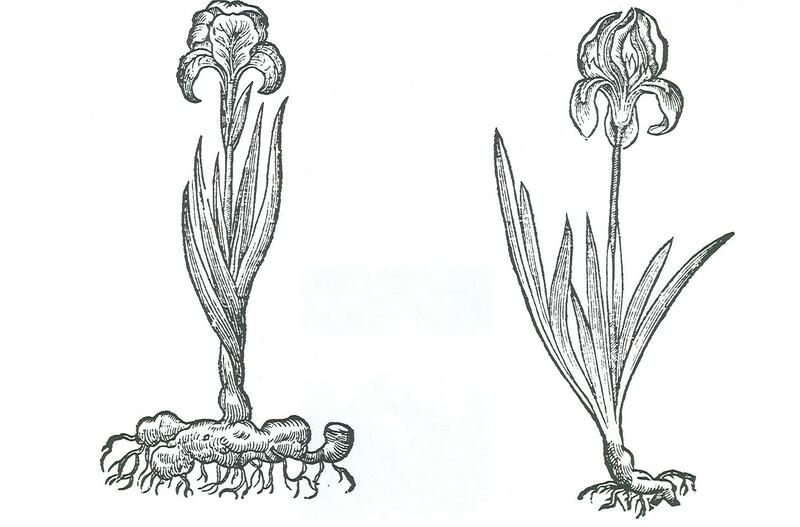 Two "chamaeirises" from 16th century gardens, the original standard dwarfs. From Gerard's Herbal of 1597.